DAYL’s “Coffee with the Court” program ventured to 1100 Commerce Street and the courtroom of United States Magistrate Judge Irma Ramirez on June 20, 2018. 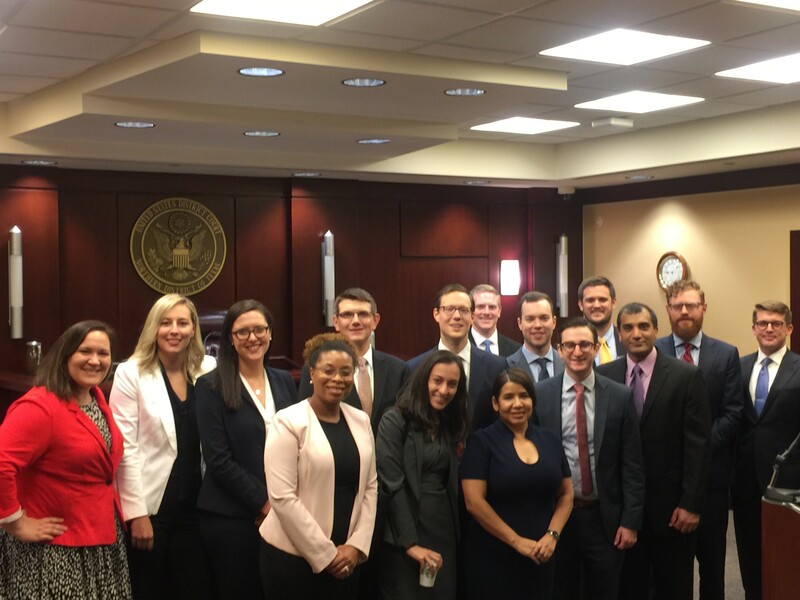 Attendees were treated to Starbucks coffee, still-hot donuts, and an intimate discussion about federal court practice and pro bono opportunities. Judge Ramirez focused the discussion on discovery matters. She opened with the nuts and bolts of discovery, including considerations for when discovery opens and closes. In sum, closely read any scheduling order to ensure you understand how the deadlines will impact when you can seek any needed relief. Also, she recommended pursuing discovery early in an action so that you have time to pursue leads from the first round of responses and involve the Court if necessary. She also emphasized the importance of substantive preparation and legitimate conferences to address disputes. For example, she generally described an action where more pre-conference contemplation may have saved both sides time and expense. There, the parties agreed to a format for the production of documents as part of the Rule 16 conference. One side later concluded a different format would be preferable and moved to compel the reproduction of documents in the different form. Judge Ramirez agreed to compel the production, at the requesting party’s cost, reasoning that the producing party should not bear the additional expense to reproduce since it had complied with the parties’ agreement. She noted that planning and meaningful discussions between opposing sides frequently can obviate fights, and that she expects counsel to be able to reach agreement on most matters. Judge Ramirez also discussed objections to discovery at length. We addressed the burden and evidence necessary to avoid responding, best practices to position your client to receive the discovery its needs, and, again, encouragement to have meaningful conferences with the other side about discovery disputes. Finally, Judge Ramirez discussed opportunities for young attorneys to secure federal court experience. She noted that she and other Northern District of Texas judges have followed Chief Judge Barbara M.G. Lynn’s lead in being more likely to hear oral argument if a party indicates a young lawyer will be leading the argument. She also highlighted pro bono opportunities. In particular, she described the Northern District of Texas’ Pro Bono Civil Panel and the type of cases – employment discrimination, civil rights, and diversity jurisdiction disputes – individual attorneys and firms have handled, resulting in numerous trial opportunities for typically younger counsel. DAYL is appreciative of the time invested by Judge Ramirez to prepare for the coffee and spend time with us and for her chambers to accommodate us.